Imagine a candle-lit dining room dressed out in Valentines décor…you are surrounded by people you know, people who care about you. The smell of an elegant meal wafts from the kitchen. This was the scene set for 25 West Midland Community couples~ many of whom are regular participants of the Monday Night Parent Education groups. “WMFC owes a heartfelt thank-you to the ladies of the Junior League of Saginaw Valley who approached us at just the right time to help make this event a reality. Their hard work and enthusiasm is greatly appreciated”, commented Gail Crosby, Connect & Serve Coordinator. "Thanks also go out to Jeff Henning of NIGHTLIFE ENTERTAINMENT who volunteered his time and talents to bring a touch of musical romance to the environment and to Ben Tierney and Robert Miller who volunteered their time and talent by providing professional photographs to each of the couples," continued Crosby. 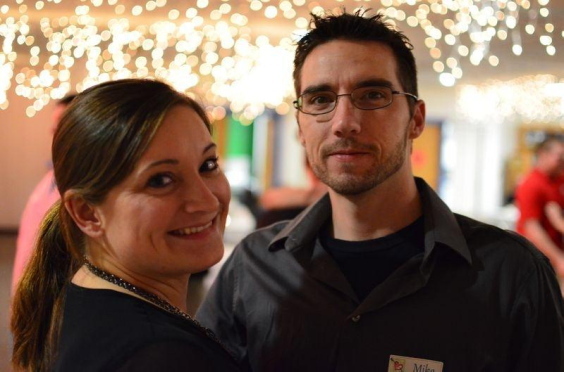 "Thanks as well to Kurt and Rebecca Faust who so graciously took their place as kitchen staff. Kurt, is the founder of STEP UP - Success though Education and Positive Coaching. He facilitates DAD2DAD (an in-depth journey though Fatherhood) at West Midland Family Center on Monday nights", concluded Crosby.